SAL DeTRAGLIA'S VIRTUAL TAPAS BAR: LOST IN TRANSLATION—THE SAGA CONTINUES. 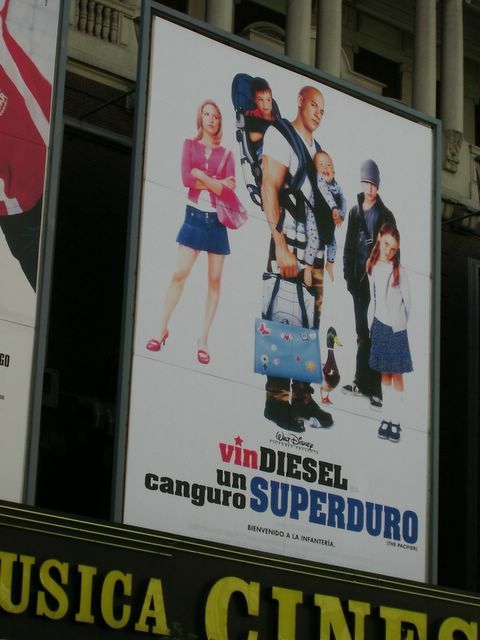 Hollywood movies playing in Spain are often hilarious. No, not because of the scripts—which tend to be devoid of comedic value, unless you have a weakness for jokes about passing gas. Rather, what’s funny about Hollywood movies is how their titles are translated. With a title like that, it sounds less like an action comedy and more like a Discovery® channel documentary. A documentary that can only be aired after 9pm. Nope - still not gonna see it! I actually learnt (a sort of) Spanish from going to the open-air cine most nights when I was a nipper, and coming away with a headache, pipa (sun flower) shells littered down my front and a few usefull phrases of the 'hands up' variety. Canal Plus was showing some old genuine spaghetti film the other day with Terence Hill, Bud Spencer, Anthony Steffen and the rest of them (all Italians) but, if you are not surrounded by a croud of pipa-eaters all gossiping, moving their chairs and occasionally shouting out in alarm 'Watch out, behind the door!' and other useful suggestions for the actors, it's just somehow not the same. Good to hear from you, amigo. I hope all is well with you and Mrs. Lenox down in Spain's south-east tip. 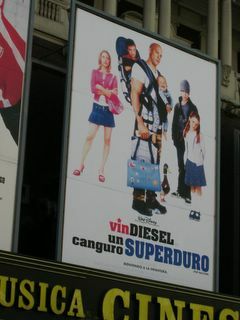 Don't assume for a minute that I have seen (or will see) Vin's new movie. I don't "do" Keanu Reeves. I don't "do" JC Van Damme. And I don't "do" Vin Diesel. I do, however, "do" vin rouge. Two glasses per day, in fact. As for your recent spaghetti western jag on Canal Plus, it sounds like a great way to kill at day. Although nothing can substitute BBC World, which Canal Digital--in their infinite stupidity--has purged from my much beloved channel 312. My shortwave radio has been working overtime since. Is there any way we can rattle Mr Polanco's cage to get him to return the Beeb to his doofie Canal Plus network? I would hate to end up as a 'Fox - Fan'. So far, with endless channels, there's barely anything to watch, and I'd probably miss it anyway not having the right 'easy-eye' TV guide. A super Hard Kangaroo would indeed be a stupid name for this movie. Canguro however is also the Spanish word for babysitter or nanny. Does it make more sense now? Ummm...my wife told me the same thing while I was taking the photo. I was hoping that no one else would notice--but I KNEW that someone would. Oh well...I couldn't forego an opportunity to make fun of Vin Diesel--even if my logic wasn't 100% correct. On a more important topic, I see that you are living in Asturias. That's a great place. And with great food. My in-laws have a piso in Villaviciosa. Man!...I wish that I had a bowl of fabada asturiana in front of me now. And you can link to me without a problem. The fabada is not one of my favourite dishes, but the rest of the food is great. But the nature is the most spectacular thing in Asturias, I guess. You can check it out in the picture section of my website.